The Disco Fries have gone from making tunes in their dorm room while guzzling cheap vodka to inducing mass ruckus at clubs across the globe with signature tracks which have been co-signed by some of the biggest names in EDM like Tiesto, Hardwell, Kaskade, Steve Aoki, and Armand Van Helden. Nick and Danny have consistently blurred the lines between genre's and managed to create a unique balance between big-room progressive melodies and their signature blown out basslines. Last year the Fries hit the road hard, performing over 70 shows from coast to coast and across the globe. Between holding down residencies in Las Vegas and NY and co-headlining their debut at Pacha NYC with Tommie Sunshine, the duo finds time to do a bi-annual tour in Asia for a string of dates throughout mainland China and Hong Kong. With support from some of the biggest players in the blogosphere such as Dancing Astronaut, DJZ, This Song Is Sick, Gotta Dance Dirty, and Digi10ve, the duo has hit the Hypem #1 spot multiple times with their releases on legendary labels such as Cr2, Strictly Rhythm, OneLove, and Vicious Recordings. 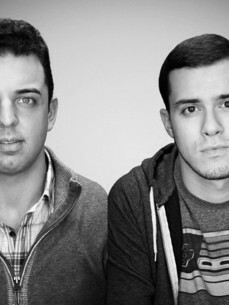 After recently being named one of VIBE Magazines "30 DJs to Watch in 2013", the Fries partnered with Novation to create a Max for Live plug-in dubbed "Konversate" for use with the Launchpad in their live sets. Between producing and touring, the duo concocts a 3-hour podcast for Scion Radio with their partner-in-crime, Tommie Sunshine, appropriately named "Fries & Shine".